A pop-up sale by two of my favourite brands – Drake’s and Edward Green – is taking place this week, starting yesterday and lasting until Sunday. Up at 12 Needham Road in Notting Hill, there were queues around the block when it opened, as you can see. Don’t worry though, stock is being replenished every day and with savings up to 80% (all Drake’s ties are £45, handkerchiefs £20), I’m sure plenty more people will be flooding in over the next few days. It’s a small shop but you will get in, don’t worry! It’s open until 8 during the week, 7 on Saturday and 6 on Sunday. You can follow the discussion on Edward Green and Drake’s sale by entering your email address in the box below. You will then receive an email every time a new comment is added. These will also contain a link to a page where you can stop the alerts, and remove all of your related data from the site. Went there upon opening and was really put off by the queues, so left (I wasn’t planning on really buying a pair of shoes, just to have a look around). I didn’t know Drake’s was on sale too, I’ll definitely try and pick up a tie or pocket hank. I just checked the website for Drake’s and I see ties are 65 pounds and handkerchiefs are 40 pounds, so it looks like the locals are getting better deals at the moment. I went yesterday lunchtime to find the above photographed queue, so didn’t bother (despite the long journey to Notting Hill). Can anyone confirm what price the shoes are? It’s worth the effort for anything approaching 80% off, but judging by what Simon says about the Drakes prices, that’s maybe 50% at most. thank you for posting this. is there a mailing list that i could join to be made aware of future pop up sales? Do you know what? The idea of this post is a very good one, even though the opportunity to go on sale at Edward Green or Drake’s when the discounts are so generous is in fact a privelege reserved for Londoners! Be that as it may, it is a good thing for Permanent Style readers wherever they happen to be living in to have this kind of information. Yet, somehow what Dave says about acquaintance with shoemaker’s lasts – see just below this comment – is of the highest importance. I was there on Wednesday evening. Most of the shoes (at least the ones I was looking at) were 295 quid. How long did you have to queue for to get in? I am thinking of going down their afterwork tomorrow! I queued for 60+ minutes on Wednesday, and once inside it was a bit of a zoo and the staff were struggling to restock so choice was limited. I popped back on Thursday at 3.30, no queue and only 5 people inside. Selection was much better and got more assistance from staff. Came away with some berkeleys at 295 (roughly 55% off). There isn’t much at 80% off but given the quality of my berkeley’s i’m very happy indeed. 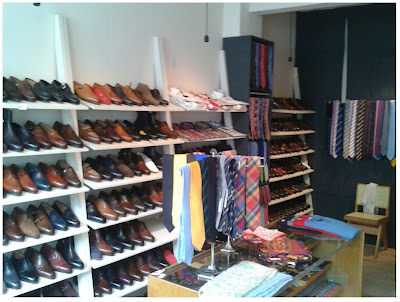 I went Friday afternoon and there were no queues, a great selection of shoes in all sizes. Nearly picked up some fantastic boots but at £490 they were a little more than I was willing to pay. Walked a away with a fantastic selection of Drakes Wool and Silk pocket squares at £20 a pop, one in the unicorn deisgn which I love. I look forward to visiting their next pop up sale!